1 of 4 In a medium heavy saucepan, combine ketchup, preserves, vinegar, onion, peach and mustard. Simmer on low 30 minutes, stirring occasionally. 2 of 4 Set up a gas grill or charcoal grill on medium-high heat for indirect grilling. Lightly grease grill rack. Season chicken with salt and pepper. Grill thighs on direct heat, skin side down, 5 minutes. Turn and place over indirect heat; close grill and grill 10 minutes skin side up. Baste every 5 minutes with barbecue sauce and continue to grill, covered, over indirect heat for 15 minutes or until internal temperature reaches 160 degrees . 3 of 4 Baste chicken breasts with sauce. Grill over direct heat 5 to 7 minutes per side or until internal temperature reaches 160 degrees . 4 of 4 Meanwhile, place any remaining sauce in a small saucepan and simmer 2 minutes. 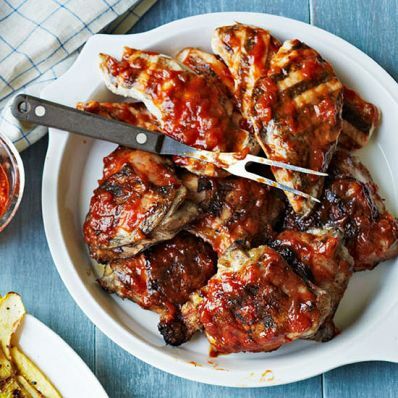 Serve chicken with remaining barbecue sauce and lemon and lime wedges for squeezing over the top.